In 1937, Oregon Agricultural College was reeling from five years of Depression-era budget cuts and staff reductions. The School of Agriculture had lost a quarter of its faculty positions. The survival of the Agricultural Experiment Station — OAC’s statewide research network — was at stake. However, with record-breaking success in fields from poultry to plant breeding and dairy science, OAC was delivering on its land grant mission. It was building the state’s economy. For station director William A. Schoenfeld and his team, it was time to celebrate. Created by the federal Hatch Act in 1887, the station had 50 years of achievements under its belt. Development of a way to remove arsenic-based pesticide residues from fruit topped the station’s own list of its 15 most important achievements. The innovative process had been adopted around the country and saved the state’s apple and pear industries from threatened market sanctions abroad. It was the kind of success that led to broad public support. During the 1930s, even as resources were shrinking on the Corvallis campus, new branch stations were opening in Medford, Burns and Klamath County. The Experiment Station was evolving into the broad based, locally connected enterprise it is today. Other milestones included a solution for Bang’s Disease (aka brucellosis), a destructive dairy cattle problem; development of the Oregon seed industry through the leadership of OAC scientist George Hyslop; a system for breeding champion egg-laying chickens; and a method for making maraschino cherries. Nevertheless, universities struggled to do the research that was necessary to fulfill their mission, and it took another 25 years for the nation’s agricultural practices to be given systematic scientific support through the Hatch Act. Sharing hard-won knowledge was another matter. 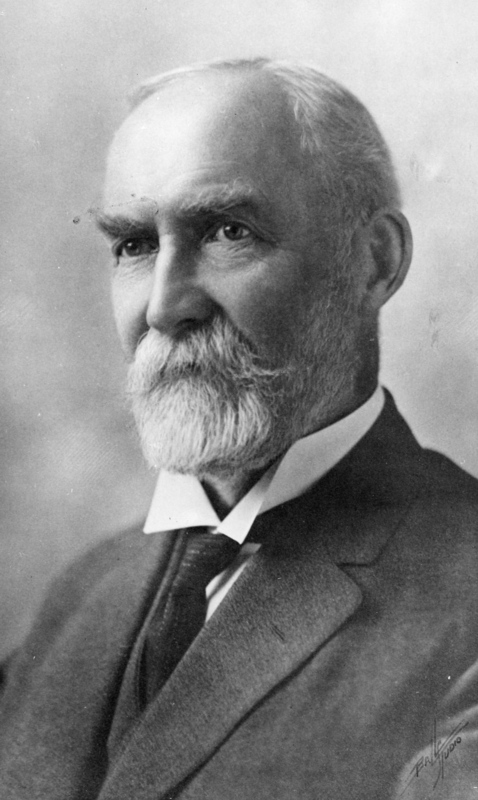 Those scientists — including James Withycombe, the respected Hillsboro farmer who became Experiment Station director and then governor — boarded trains and conducted farmers’ institutes in southern and western Oregon. They gave lectures and showed photos with a steriopticon, a predecessor of slide and film. These events were so popular that the state Legislature allocated funds to conduct more, and 25 years after the Hatch Act, the federal government created the Extension Service. “Now we’ve got this system in place that eventually grows to become the envy of the world,” says Arp. “We have the Cooperative Extension Service coupled with research coupled with the land grant university. Solving local problems has been the bread and butter of agricultural science: how to raise wheat where rainfall is abundant or barely fills a coffee cup; how to produce grass seed without burning the harvested stubble; how to foster native bunch grasses and sage brush on weed infested rangelands. But increasingly, says Arp, it’s the global challenges that keep researchers awake at night. Farm on Helmick Rd., OR, by Connie Mueller, Eugene. 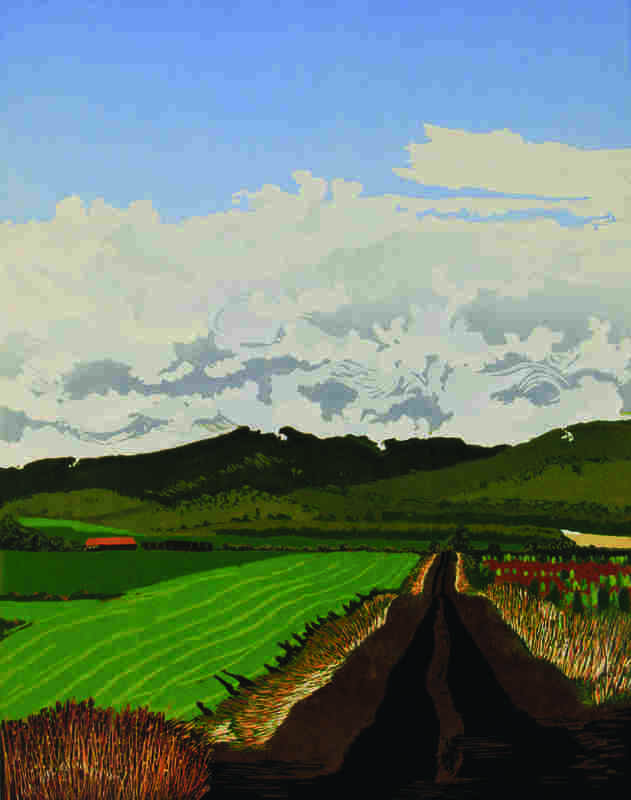 Mueller was granted the 2018 Dean and Director, College of Agricultural Sciences and Oregon Agricultural Experiment Station; and the Paul Lamb and Reese Lamb Memorial Art About Agriculture purchase awards, sponsored by Dan and Wanda Arp, the Lamb Foundation, and the College of Agricultural Sciences, Oregon State University. Technology is likely to be part of the answer. Genomics, robotics, sensors, geoengineering, artificial intelligence and other tools are already reshaping food production. They are contributing, says Arp, to what Paul Jepsen, director of OSU’s Integrated Plant Protection Center, calls “sustainable intensification.” In short, we’ll need to produce more food per acre in a way that can be sustained for the long haul. For a perspective on that future, it helps to start with old photos. 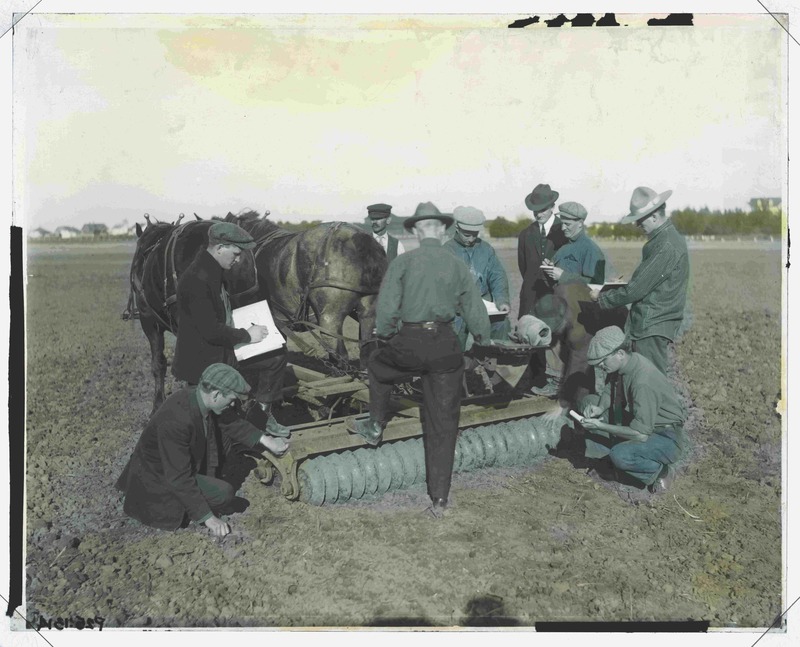 Chad Higgins, associate professor in the Department of Biological and Ecological Engineering, wonders if his predecessors — who are pictured with horse-drawn carriages, dressed in coats and ties for the lab — would have had a clue about how agriculture would change over the following century. Likewise, researchers and food producers 150 years from now might look back and wonder if we really had any idea where things were headed. “But the trend has always been to increase the efficiency, increase the productivity, increase the automation, increase the control,” says Higgins, “and I wonder if the end state is complete automation. Higgins explores the intersection of farming and technology. For example, he and his students are testing the idea that RFID (radio-frequency identification) devices, which are commonly used to track inventory in retail stores, can generate a round-the-clock, area-wide picture of soil moisture. Such information could help fine tune planting and irrigation schedules. The researchers are using unmanned aerial systems (drones) to record light reflected from plant leaves and to translate data into indications of stress. Competition over land, he adds, will drive further innovations. The push for renewable energy is a case in point. In Eastern Oregon, Higgins and his colleagues have already shown that planting some crops under solar collectors can reduce water stress while simultaneously increasing plant productivity and the operating efficiency of the solar array. It would not work with all crops, such as those that require combines or other large machinery. Nevertheless, farmers in Central and Eastern Oregon could manage sunlight in the same way they now manage other inputs such as water and fertilizer. While tomatoes and other vegetables can be produced in hydroponic systems — networks of pipes that carry water-based nutrients to plant roots — most crops will continue to be planted in the soil. And despite the inherent properties of earth from place to place, says Jay Noller, professor and head in the Department of Crop and Soil Science, agriculture is increasingly being done in soils that are the result of geoengineering. As examples, Noller points to terraces near Boise, Idaho, where “they brought in a Southern California housing development approach,” bulldozed hills into level terraces and constructed a mixture of soils on site. In the Yangtzee River delta in China, bioplastic-wrapped rice fields can be measured by the square mile. That approach contrasts with the ongoing shift toward no-till practices in much of the United States. By not plowing their fields and drilling seeds into undisturbed ground instead, farmers reduce the likelihood of soil erosion, cut carbon emissions to the atmosphere (and possibly store more carbon in the soil) and allow underground ecosystems to develop. 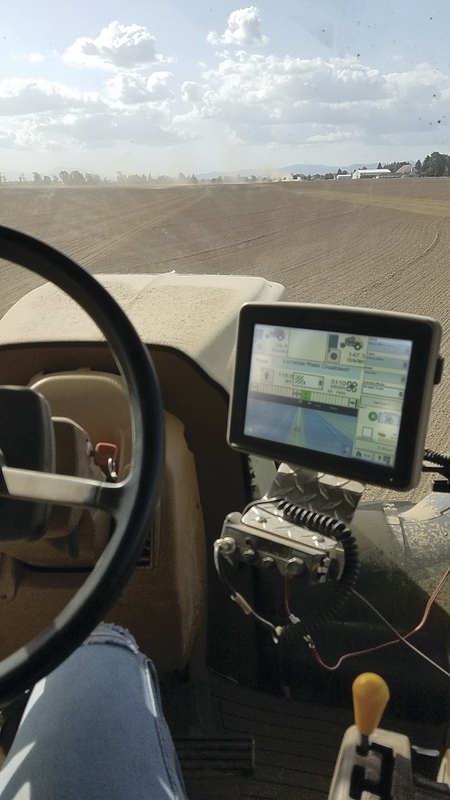 Weeds are generally managed with herbicides in conventional practice today, whereas in the future, they’ll be outcompeted by new crop varieties or obliterated by automated field machinery. Plant pathogens will be moderated by a grower focus on healthy soil. 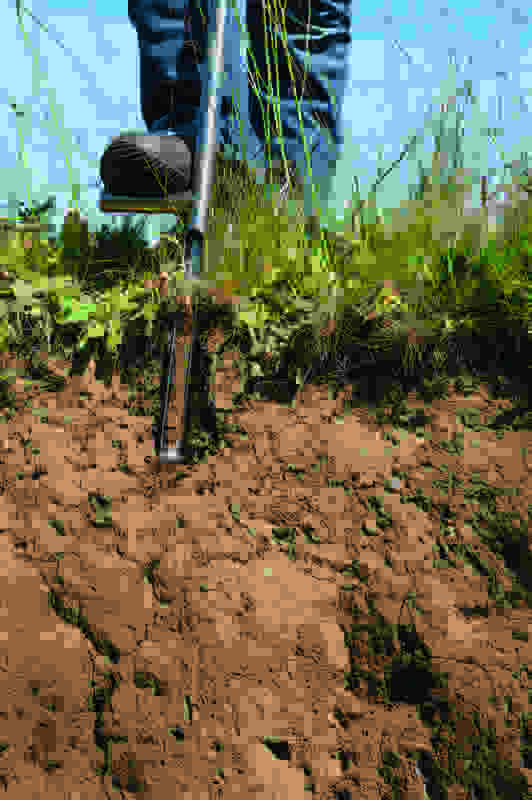 Soils evolve over centuries, says Noller, and it will probably take at least 150 years to determine what soil properties — biological, chemical and physical — result from current no-till practices. To understand such changes, researchers are already developing the ability to scan all the genomes present in a soil sample. As farmers test their soils for growing specific crops or to determine the results of geoengineering, “that genetic fingerprint will let us know if we’re successful, if we have what we need to grow food,” says Noller. Although Oregon policymakers have set the state on a clear path toward wild instead of farm-raised fish, Oregon State University has been a leader in international freshwater aquaculture. 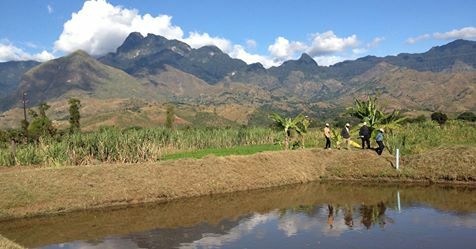 Growth of this industry, what economic development experts call the “blue revolution,” means that it is likely to become a bigger part of global food production in the future. Through the efforts of Hillary Egna, lead scientist and director of OSU’s Aquafish Innovation Lab, fish farming has become an increasingly important source of nutrition and economic development in places like Southeast Asia, sub-Saharan Africa and Central America. Over the last decade, largely with funding from the U.S. Agency for International Development, Egna and her colleagues in the United States and abroad have trained more than 10,000 people in aquaculture methods and marketing. Production has increased to the point that in some countries, farm-raised fish are being sold to meet local needs and to provide badly needed export income. In Oregon, aquaculture is likely to serve high-value, niche markets. The state has a long history with oysters, and another opportunity lies with dulse (seaweed), especially the variety that tastes like bacon when properly cooked. Although Oregon’s natural resources could support well-regulated, fresh-water fish farms, environmental laws and concerns over wild fisheries, says Egna, are likely to constrain future development. When it comes to breeding new plant varieties, Pat Hayes takes the long view. 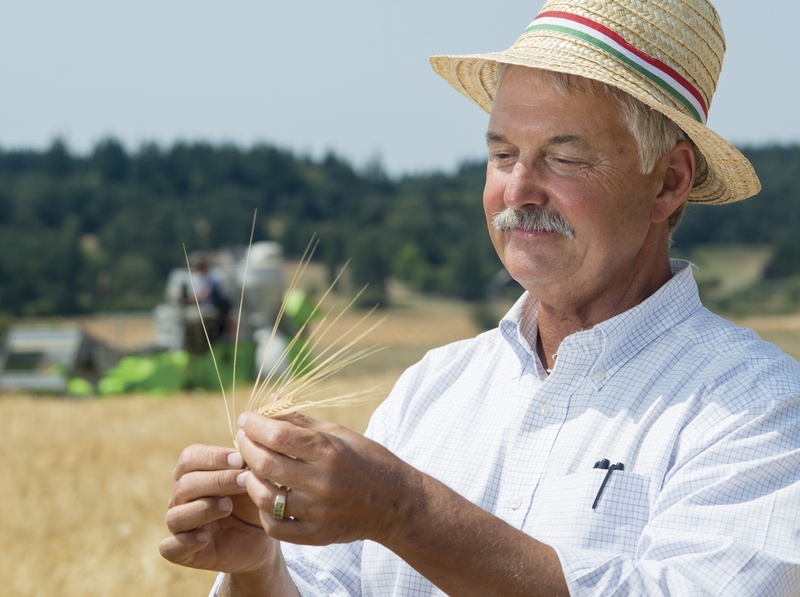 The professor in the Department of Crop and Soil Science and director of Barley World at OSU notes that two years before Oregon State was designated a land grant college, an Austrian monk published groundbreaking work on the nature of trait inheritance in peas. However, Gregor Mendel’s paper was largely forgotten until 1900. Before that, there was little to no plant breeding for scientific purposes at Oregon Agricultural College or anywhere else. Its rediscovery launched a frenzy of research to identify Mendel’s “elements” that are responsible for variations in plants. “One hundred and fifty years ago,” says Hayes, “Mendel figured out what variants were and how they’re inherited, and now we can create new variants, new genes.” Geneticists can explore and manipulate the genome with precision, although, says Hayes, developing varieties with desirable traits can usually be done by traditional breeding techniques. 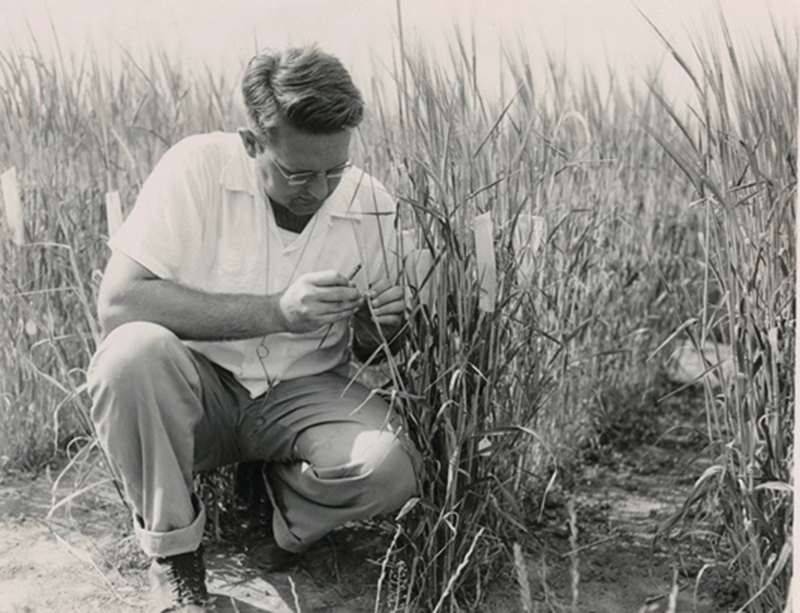 Hayes and his colleagues specialize in barley, one of the first domesticated crops. With a genome that is smaller than that of wheat, barley offers plant breeders the advantage of relative simplicity. Hayes’ lab has focused, for example, on the genes responsible for cold tolerance and light sensitivity, traits that could be important for helping varieties adapt to climate change. In the late 1800s and early 1900s, ranching in Eastern Oregon nearly became a “tragedy of the commons.” With no regulation, cattle were allowed to overgraze on native bunchgrasses and other high quality forage. “We’re still dealing with the consequences of that,” says David Bohnert, director of the Eastern Oregon Agricultural Research Center in Burns. Both Oregon State University and the USDA Agricultural Research Service employ researchers at the EOARC. Bohnert and his colleagues tap expertise across the West to answer common problems, from cattle genetics to sage-grouse restoration and the consequences of grazing by wild horses and burros. When breeding new livestock, for example, ranchers tended to stick with favorites such as Angus or Hereford. That may change as a result of ongoing studies of how cattle genetics affect an animal’s fitness for a specific environment, says Bohnert. 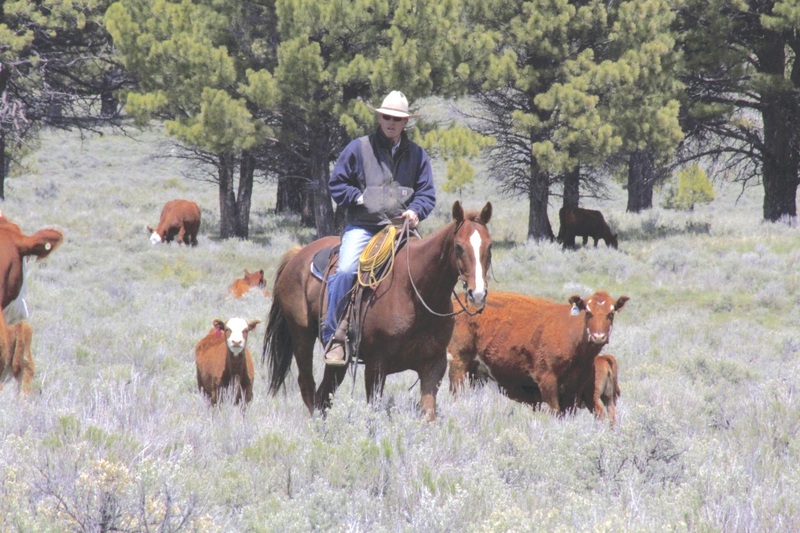 In the future, ranchers will take advantage of knowledge from rangeland studies of grazing impacts on invasive plants and the effects of horses on sage-grouse nesting behavior. They are also likely to be using GPS to track their herds. It costs about $200 to put a GPS unit on a cow. “You don’t need to put them on every animal,” says Bohnert, “but what if you could put them on a few animals that are representative of your herd and see where your cattle graze? Although Bohnert sees a continuing demand for mass-market beef, ranchers will pay more attention to managing cattle for specific consumer preferences. “Organic,” “grass-fed” and animals raised without the use of antibiotics will likely continue to command a higher price in the marketplace, he says. Even as agriculture continues to change through technology and other innovations, rural economies will reflect the stunning variety of Oregon’s landscape: rivers, mountains, forests, grasslands, bays and harbors. Nevertheless, for the community as a whole, technology can also raise the threat of external competition. Success increasingly demands that local businesses keep track of trends outside the community in order to respond to economic changes. The astounding variety of modern foods becomes apparent just by walking down the aisles of a grocery store. While the produce, meat and seafood sections offer fresh, minimally processed products, everything else has been dried, canned, fermented, baked or frozen. All of it has been packaged at a cost in materials and energy. Zhao’s lab focuses on such natural, biodegradable packaging materials as chitosan, which stems from crab and shrimp shells and offers antimicrobial and antioxidant benefits. 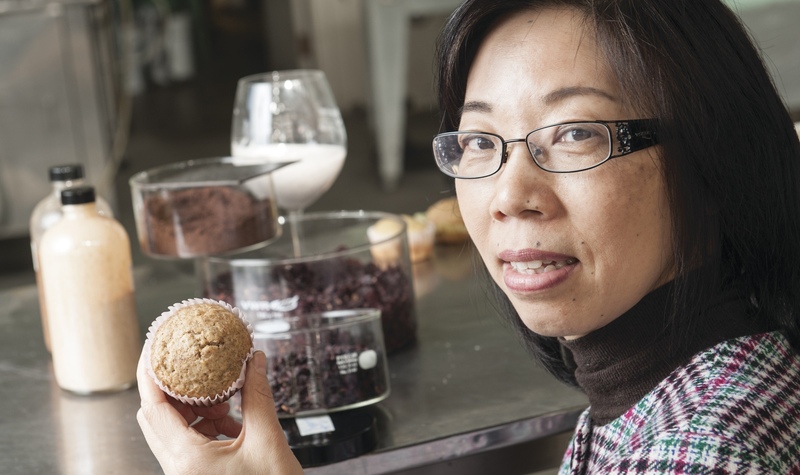 By combining chitosan with other natural substances, Zhao and her team have created edible coatings and films that can help extend the shelf life of fruits, fish, meats and other products. Zhao is also exploring the uses of a fruit processing and winemaking byproduct known as pomace, which consists of stems, skins and seeds. While fruit juice and wine makers must find ways to have pomace removed from their facilities, Zhao has shown that the material can be turned into a nutritionally beneficial food ingredient or converted into biodegradable packaging materials. OSU’s land grant heritage arises naturally from the state’s diversity. The College of Agricultural Sciences, Agricultural Experiment Station and Extension Service serve people and communities from the coast to the mountains and rangelands of Eastern Oregon. They work from the valleys of southern Oregon to the Portland metro region and the Columba River. The perspectives reflected in this story offer a diverse but small slice of the community of experts who serve Oregonians and collaborate with people throughout the world.